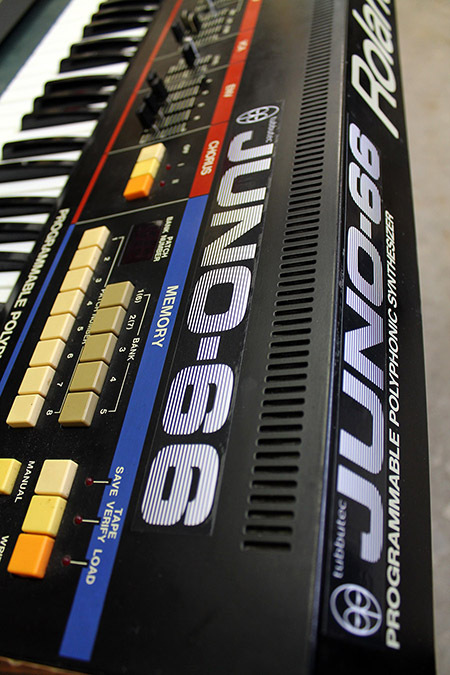 The Juno-66 is an upgrade for Roland Juno-6 and Juno-60 synthesizers. It turns your Juno into a powerful Juno-66 synthesizer with midi and a lot of additional features. Midi in- and output. Can output key presses, arpeggiator, Powerarp and chord memory. Powerarp: A powerful sequencer that includes breaks and note lengths and can be triggered by the arp clock, trigger, midi clock or midi trigger. Features various direction, transpose and random modes. Two additional filter LFOs: A triangular LFO with a frequency of up to 2.2kHz and a S/H style LFO with various clock sources. A second ADSR for the filter. Detuning. Turns your Juno into an organic analogue synth. Alternative tunings: Select from a range of non-equal tempered tunings or upload a custom scale. Midi filter, pitch bend, arp and portamento control. Settings via an internal configuration menu or external midi controller. For a complete list of features please refer to the user manual. 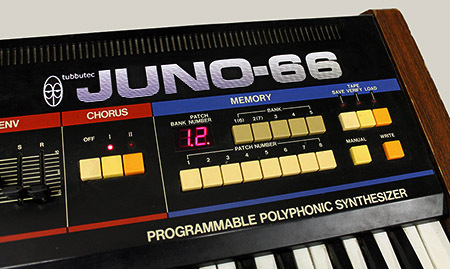 The Juno-66 adds additional play modes to the existing 6-voice polyphonic mode. The Duophonic mode layers 3 oscillators for each voice and slightly detunes them. The result is a fatter sound, often called supersaw or supersquare. The amount of fatness can be adjusted. The two Monophonic modes layer all six oscillators to create an even thicker sound. The fatness is adjustable. You can also select between two envelope retrigger behaviours. Chord Memory lets you define a chord of your choice with up to six notes. You can then play and transpose it using the keyboard. Polychord lets you assign an individual chord to each key of the keyboard. You can play the chords using the keyboard. 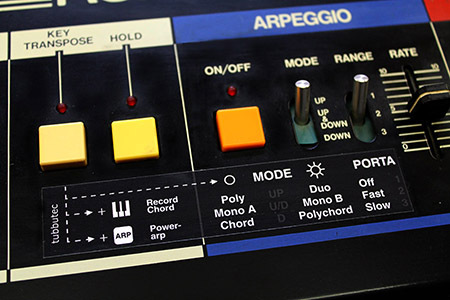 The Powerarp is a built in sequencer. A new sequence can be quickly entered and can also include breaks and different note lengths. The sequencer can then be triggered by various clock sources. The sequence can be transposed using the keyboard and shifted forth and back in time. Forward, backward, forward-backward and three different random modes can be selected and the sequence automatically transposed over two octaves. An external trigger, the internal arp clock, midi note trigger and midi clock are possible trigger sources. A divider for the midi clock can be set and adjusted in real time without losing sync. A polyphonic portamento that works in all play modes including chord memory and Polychord! You can adjust the speed and two preset speeds are directly accessible via a switch on the synth. The portamento is linear on a musical scale and you can select between constant time or constant speed behaviour. A special algorithm makes sure that even in Polychord mode the portamento sounds natural. If you do not want to install the mod yourself contact us or find a synth technician in your area – they will be happy to do it. Juno-66 is a replacement for the original Juno-6/60 processor. This processor needs to be de-soldered and replaced with a socket. The socket can then be used for the Juno-66 – or if you like to revert the mod for the original processor. To install the midi sockets you need to drill a few holes in the back of your synthesizer. 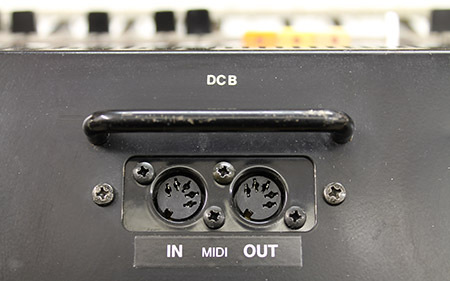 For the Juno-60 a replacement panel for the DCB connector is offered and no drilling is needed. If you want to have midi to filter and pitch bend control a few resistors need to be soldered. All necessary parts are included in the kit. Please read this disclaimer before installing the mod. The Juno-66 is designed an manufactured in Germany. Only lead free components and solder are used. Juno-66 can be ordered online in our shop. We ship from Germany with fixed shipping costs worldwide. If you want us to install the mod for you please contact us. Q: Do you lose any features by installing the mod ? Q: Does this have midi controlled pitch bend? Q: Is the Juno 60’s DCB interface still working? Q: Can I still save the Juno-60 patches? A: Yes of course. 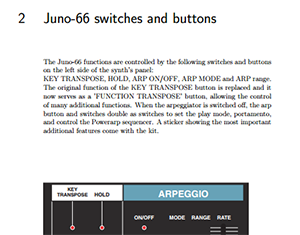 Juno-66 parameters however are not saved in a patch due to technical reasons. Q: Is the tape interface still working? 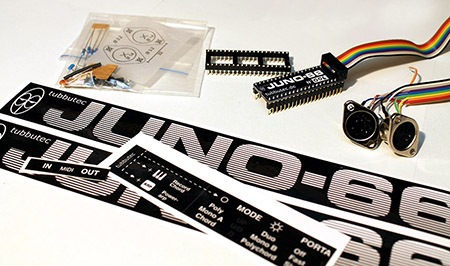 “Managed to install the Juno-66 in about 2 and a half hours, most of that taken up by desoldering the original cpu. So far it works flawlessly, and I’m quite clumsy with a soldering iron! I’m seriously impressed. As far as I’m concerned it’s a work of genius, incorporating so many interesting and contemporary features into a 33 year old interface. I’ve never come across such a good quality and good value synth mod. Brilliant!